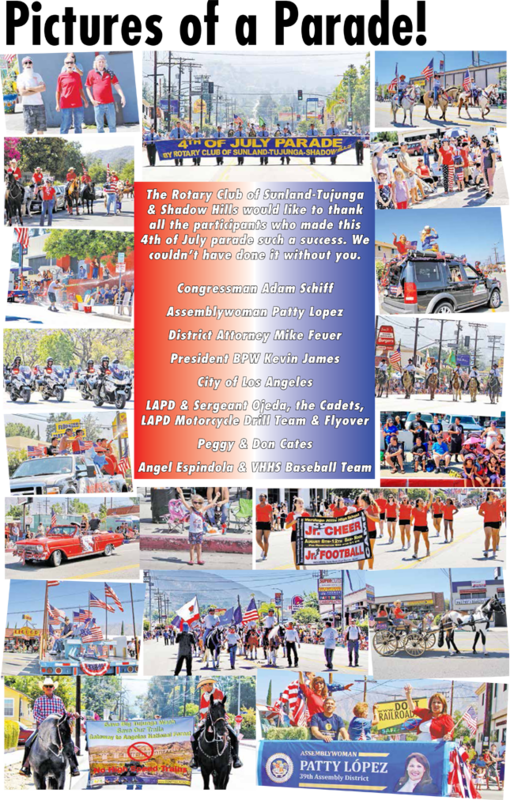 The 4th of July Parade presented by the Rotary Club of Sunland-Tujunga/ Shadow Hills began at the bend of Foothill Boulevard and Mount Gleason at 10 a.m. and traveled two miles down the community’s main thoroughfare to finish at the Sunland Park. Putting a parade together is not an easy feat. The Rotary Club began in February to obtain the necessary permits from the City of Los Angeles as well as to gain approval for the street closures. Then they had to work with local volunteers Peggy and Don Cates to determine the amount and kind of barricades that were needed, to make arrangements with the Department of Transportation to deliver the barricades, to arrange the putting up and taking down of “No Parking” signs, provide for traffic control and to insure post-parade street sweeping. A lot of behind-the-scenes planning had to be done before the parade could even be promoted. This year’s parade featured Brian Schneider as the parade grand marshal, the Verdugo Hills High School Cheerleaders whose performances prompted rousing cheers, mounted and marching color guards, floats of all shapes and sizes, and vehicles representing the Fire, Forestry and Police Departments. Of course, there was the volunteer fire department with its yearly water event. Everybody that was anybody was there having fun. It is estimated that more than 2,000 people lined Foothill Boulevard for the parade — making it the largest and most successful community event in the past four years.